Soltani, H., Shafiei, S. (2015). Isothermal Reactor Network Synthesis Using Coupled NonDominated Sorting Genetic Algorithm-II (NSGAII) with Quasi Linear Programming (LP) Method. Iranian Journal of Chemical Engineering(IJChE), 12(3), 77-95. Hadi Soltani; Sirous Shafiei. "Isothermal Reactor Network Synthesis Using Coupled NonDominated Sorting Genetic Algorithm-II (NSGAII) with Quasi Linear Programming (LP) Method". 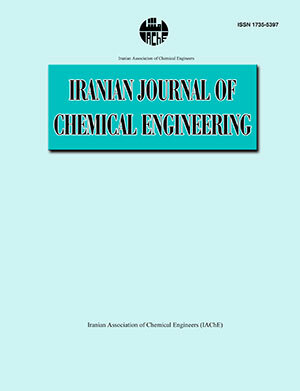 Iranian Journal of Chemical Engineering(IJChE), 12, 3, 2015, 77-95. Soltani, H., Shafiei, S. (2015). 'Isothermal Reactor Network Synthesis Using Coupled NonDominated Sorting Genetic Algorithm-II (NSGAII) with Quasi Linear Programming (LP) Method', Iranian Journal of Chemical Engineering(IJChE), 12(3), pp. 77-95. Soltani, H., Shafiei, S. Isothermal Reactor Network Synthesis Using Coupled NonDominated Sorting Genetic Algorithm-II (NSGAII) with Quasi Linear Programming (LP) Method. Iranian Journal of Chemical Engineering(IJChE), 2015; 12(3): 77-95. In this study a new and robust procedure is presented to solve synthesis of isothermal reactor networks (RNs) which considers more than one objective function. This method uses non-dominated sorting genetic algorithm II (NSGAII) to produce structural modification coupled with quasi linear programming (LP) method for handling continuous variables. The quasi LP consists of an LP by adding a search loop to find the best reactor conversions as well as split and recycle ratios which are much easier to solve. To prevent complexity and ensure optimum solution, only ideal continuous stirred tank reactors (CSTRs), plug flow reactors (PFRs) and PFR with recycle stream are considered in producing reactor networks. Also, to avoid differential equations which appear in design equations of PFR reactors, CSTRs in series are replaced for each PFR. Results show that the proposed method finds better solutions than those reported in the literature. Smith, R., Chemical process design, McGraw-Hill, New York, P. 459 (1995). Horn F., "Attainable and non-attainable regions in chemical reactor technique", in 3ed European Symposium on Chem. Reac. Eng., London, Pergamon Press (1964). Glasser, Crowe, D., C. and Hildebrandt, D., "A geometric approach to steady flow reactors: the attainable region and optimization in concentration space", Ind. Eng. Chem. Res., 26 (9), 1803 (1987). Hildebrandt, D. and Glasser, D., "The attainable region and optimal reactor structures", Chem. Eng. Sci., 45 (8), 2161 (1990). Hopley, F., Glasser, D. and Hildebrandt, D., "Optimal reactor structures for exothermic reversible reactions with complex kinetics", Chem. Eng. Sci., 51 (10), 2399 (1996). Glasser, D. and Hildebrandt, D., "Reactor and process synthesis", Comput. Chem. Eng., 21, 775 (1997). Rooney, W. C.," Convex attainable region projections for reactor network synthesis", Comput. Chem. Eng., 24 (2), 225 (2000). Kauchali, S., "Linear programming formulations for attainable region analysis", Chem. Eng. Sci., 57 (11), 2015 (2002). Khumalo, N., "The application of the attainable region analysis to comminution", Chem. Eng. Sci., 61 (18), 5969 (2006). Kokossis, A. C. and Christodoulos, F. A, "Optimization of complex reactor networks—I. Isothermal operation", Chem. Eng. Sci., 45 (3), 595 (1990). Kokossis, A. C. and Floudas, C. A., "Optimization of complex reactor networks—II. Nonisothermal operation", Chem. Eng. Sci., 49 (7), 1037 (1994). Floudas, C. A., Nonlinear and mixed-integer optimization: Fundamentals and Applications, 1st ed., Oxford University Press, New York, USA, P. 480 (1995). Schweiger, C. A. and Floudas, C. A., "Optimization Framework for the Synthesis of Chemical Reactor Networks", Ind. Eng. Chem. Res., 38 (3), 744 (1999). Chitra, S. P. and Rakesh, G. "Synthesis of optimal serial reactor structures for homogeneous reactions. Part I: Isothermal reactors", AIChE J., 31 (2), 177 (1985). Achenie, L. K. E. and Biegler, L. T., "A superstructure based approach to chemical reactor network synthesis", Comput. Chem. Eng., 14 (1), 23 (1990). Burri, J. F., Wilson, S. D. and Manousiouthakis, V. I., "Infinite DimEnsionAl State-space approach to reactor network synthesis: application to attainable region construction", Comput. Chem. Eng., 26 (6), 849 (2002). Abraham, T. K. and Feinberg, M., "Kinetic Bounds on Attainability in the Reactor Synthesis Problem", Ind. Eng. Chem. Res., 43 (2), 449 (2003). Manousiouthakis, V. I., Justanieah, A. M. and Taylor, L. A., "The Shrink–Wrap algorithm for the construction of the attainable region: an application of the IDEAS framework", Comput. Chem. Eng., 28 (9), 1563 (2004). Zhou, W. and Manousiouthakis, V. I., "Non-ideal reactor network synthesis through IDEAS: Attainable region construction", Chem. Eng. Sci., 61 (21), 6936 (2006). Zhou, W. and Manousiouthakis, V. I., "On dimensionality of attainable region construction for isothermal reactor networks", Comput. Chem. Eng., 32 (3), 439 (2008). Ashley, V. M. and Linke, P., "A Novel Approach for Reactor Network Synthesis Using Knowledge Discovery and Optimization Techniques", Chem. Eng. Res. Des., 82 (8), 952 (2004). Silva, L. K. d., "Reactor network synthesis for isothermal conditions", Acta Sci-Techno., 30 (2), 199 (2008). Jin, S., Li, X. and Tao, S., "Globally optimal reactor network synthesis via the combination of linear programming and stochastic optimization approach", Chem. Eng. Res. Des., 90 (6), 808 (2012). Marcoulaki, E. and Kokossis, A., "Stochastic optimisation of complex reaction systems", Comput. Chem. Eng., 20, 231 (1996). Cordero, J. C., "Synthesis of optimal reactor networks using mathematical programming and simulated annealing", Comput. Chem. Eng., 21,47 (1997). Marcoulaki, E. C. and Kokossis, A. C., "Scoping and screening complex reaction networks using stochastic optimization", AIChE J., 45 (9), 1977 (1999). Linke, P. and Kokossis, A., "On the robust application of stochastic optimisation technology for the synthesis of reaction/separation systems", Comput. Chem. Eng., 27 (5), 733 (2003). Revollar, S., Lamanna, R. and Vega P., "Algorithmic synthesis and integrated design of chemical reactor systems using genetic algorithms", Proceedings on in Automation Cong., (2004). Sassi, M. and Amira, N., "Microwave plasma thermal decomposition of H2S", Int. J. Hydrog. Energy, 37, 10010 (2012). Vourliotakis, G. Skevis, G. and Founti, M. A., "Assessment of the reactor network approach for integrated modelling of an SOFC system", Int. J. Hydrog. Energy, 36, 6112 (2011). Bhaskar, V. Gupta, S. K. and Ray, A. K., "Multi-objective optimization of an industrial wiped-film pet reactor", AIChE J., 46 (5), 1046 (2000). Behroozsarand, A. and Shafiei, S., "Control of TAME reactive distillation using Non-Dominated Sorting Genetic Algorithm-II", J. Loss Prevent Proc., 25 (1), 192 (2012).